The end of the cooktop nightmare… I hope! For those of you who are jumping in right now… here is a quick recap, just for you. A week ago, I managed to ruin my glass induction cooktop by starting to many large pots (making broth) at the same time. Well that was not the worst of it. A couple of day after I got a new cooktop into the house, I manage to drop a heavy glass jar on it and and yep… it breaks into “a thousand” pieces (well not really a thousand.. but you get the drift). Now luckily as part of the deal, when I bought the new one, I got and extra coverage insurance with it.. that should cover this type of accidents…. So I’ve got good news, great news and maybe some slightly less good news! The day after my accident (yes, it was an accident.. I did not thrown that glass jar on my brand spanking new cooktop) I called the insurance company, and “Yes, off course. We will cover this. This happens more than you know. No problem. Just take it back to where you bought it, and they will either fix it or get you a new”. Whoa, it that isn’t good news I don’t know what good news are. 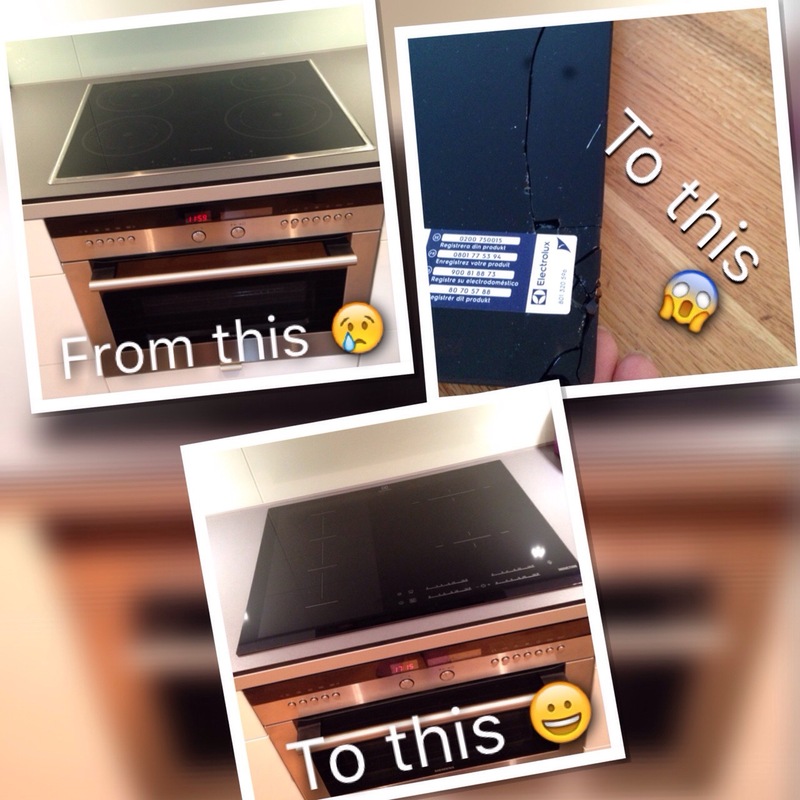 I felt so relieved (wouldn’t that have been a nightmare if the answer was no… after all, it was an expensive cooktop). So B and I took off with the broken one, back to where we bought it in the first place. When I bought the cooktop, we were alternating between two models. We picked the one that was the most powerful of the two. When picking it, I had discussed with the seller that me keeping it, was contingent of us being able to use all my pots and pans on it (and yes.. every one of them works on inductions cooktop, as this was what I had before). If I couldn’t make them work I would probably be back to swap it for the other model (which was no problem as they have a 30 day return policy). As a result.. B and I had concluded that choice number two would probably be a better solution… and we had just concluded this, when the accident happened. Oh noooo, now the big question was, would we still be able to swap the cooktop for our second choice? Since this might take weeks.. they have given me the new one, as a “new sale”, by creating an invoice with a 30 day due date. What does this mean for me? If all goes according to plan.. I have no problem, as they will just do a swap and the invoice goes away. If all goes belly up.. it means I have an invoice that is due in 30 days that need to be paid… as I’m registered in the shop as having bought two cooktops. From the sellers mouth, to Gods ears.. I hope that is true! Yay x 2 . . . NOW, get cooking! What’s the first thing you wanted to do on your shiny new stove? YAY!! Please, God, let everything go as planned!! SO, what happened to the original broth?? Induction is when it stays cool, right? ?